For Amos Wood of Blockhouse, it's akin to a contract made in heaven. Following a time when the design, mill work and furniture company was in a spring slump along with much of the rest of the woodworking industry in the province, Amos landed the contract to provide six windows for the historical St. Mary's Basilica in Halifax. "Out of the slump it just went with a roar. And part of the roar for us was getting the contract with this," owner Jeff Amos told LighthouseNOW explaining how the industry is now going full-bore. The window project, under general contractors Dora Construction, encompasses approximately 5,000 board feet of wood and 1,200 man hours for Amos. The Blockhouse company has been contracted to replace six windows in the basilica, a Gothic Revival structure built between 1820 and 1829 out of granite and ironstone. Installation is set to begin within a couple of weeks. 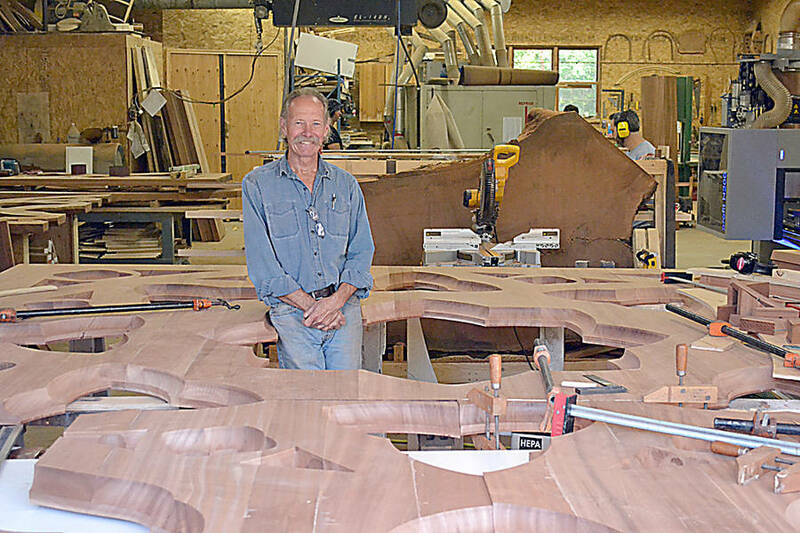 The windows will be constructed out of Sapele Mahogany, a hardwood from sub-tropical Africa. "Unfortunately," says Amos of the material. "But it was less expensive than our Western Red Cedar, which would have been a good material to use, but cost ruled the day." While the original windows were made of pine, Amos maintains that the pine available on the market today is "so young. "It simply doesn't have the resistance factor that the slower growing, older wood from time ago had." According to Amos, the forests are now working on a 60- to 80-year rotation, "which cannot give us 200-year-old wood." Amos said only one other company bid on the window contract. He maintains his company was chosen because it has the technology to produce the windows, having invested approximately $200,000 last year in a new computer numerical control (CNC) machine. "And we're well known for our skill in working wood," he adds. Amos has five employees working full-time on the project, with the first of the windows to be delivered in the middle of the month. The colored and lead glass for the windows, ranging in size from 13 feet by 17 feet and eight feet by eight feet, is being provided by Sattler Stained Glass Studio in Pleasantville, which also provided the new windows for St. John's church in Lunenburg.